Having 30 contact hours to prepare candidates for IELTS is one thing; needing to squeeze IELTS prep for a couple of students into your already busy schedule is quite another. It inevitably means that the students will need to take more responsibility for their learning — but what if they aren’t able to do that? Most students are not sophisticated language learners, and preparing for a complex test like IELTS is a significant challenge. I’d like to suggest a four-step process that will provide a structure for the students’ work, leaving you free to guide and advise. You probably have a pretty good idea of their level of English, but IELTS readiness is a very different matter: it hinges on whether the test taker is competent in tackling the task types. Have you ever tried a Yes / No / Not Given test? The first time I did one I was shocked to find there were questions I simply couldn’t answer — and I’m an English teacher. It’s important to make candidates aware that they probably won’t have seen many of the task types before. So, step one is to ensure they understand the test and the challenges it poses. This can be done using the Free Version of Road to IELTS. To start, link your students to the Free Version and guide them to the Study Planner. This gives them 16 activities, four for each paper, that cover a whole range of IELTS tasks. Thirteen of the activities can be done in the Free Version itself (if you substitute Speaking Test 1 for Test 3 in the final activity). Students will realise how different IELTS is from the school English exams they are used to. Crucially, the activities will give you and them an idea of their relative performance in the four papers. With limited time available, it is important to allocate it intelligently. There is plenty of research to show that students tend to focus on the skills they are good at, shying away from the more challenging areas where they really should be spending their time. Based on all this information, work with them to draw up a study plan. The advantage of choosing Road to IELTS is that it is designed primarily as a self-study resource. There are videos, interactive activities with feedback and practice tests with a timer. Every aspect of the IELTS test is covered — and students can subscribe for as little as $49.99. The real strength of Road to IELTS is not in improving a learner’s English; it is in equipping them to get their best possible band score in IELTS. 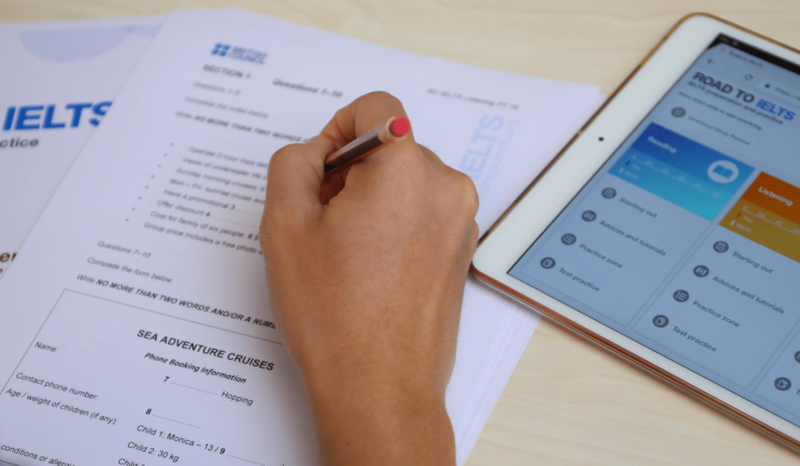 A study of 130,000 British Council-registered Road to IELTS users showed that the learners who use it the most improve by as much as 52% on their initial score in a given area. Obviously, it is not realistic to suppose that their English has improved by this much in the hours they spent on the program. The conclusion is that they have become more proficient at tackling the IELTS task types. All of these help with IELTS test-readiness, and they have the advantage of popping alerts onto the student’s phone, providing regular study reminders. The blog breaks down into skill areas, so you could work the posts into the study plan, agreeing with your learners that they will focus on the papers where they most need to improve. The final step is to ensure they are actually following the study plan you have put together and agreed on. This is where the Road to IELTS Progress Reports come in. The Score Details report lists the activities the student has completed, along with the scores they achieved. It also tells you when each activity was completed, so you can see whether students are sticking to their study plan, or doing everything at the last minute. The Analysis report gives a visual display of how students are breaking down their time by skill — it’s a quick and easy way of comparing the relative performance diagnosed in Step 2 above with the reality of what they are actually doing. Finally, teachers following this model like to have regular, short counselling sessions to monitor progress, answer questions and discuss problems. There’s an example of a similar IELTS prep model here. If students are unable to attend IELTS prep classes, the key to helping them is to maximise their input and focus yours on the areas where it really counts: diagnosing, planning, reviewing and counselling. Road to IELTS will help you do that. Visit Road to IELTS and get a free Study Planner to help your students get started. Access the IELTS Score Calculator here.